Mason Falls Circuit at Kinglake. 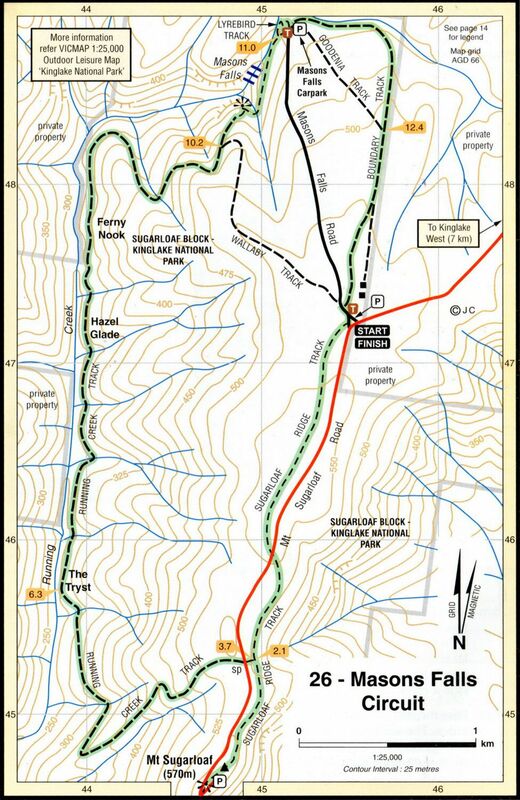 This walk is a good 13km from start to finish and it winds its way through a variety of terrain and scenery. The first part following Sugarloaf Ridge Track was a pleasing descent through the burnt remains of gum trees. Green was everywhere and the forest has recovered well from the bush fires of 2009. Next begins the descent down towards Running Creek. At the end is a beautiful place where the track meets Running Creek and it’s a great place for a break. After resting at The Tryst, we continued on to Hazel Glade and Ferny Nook. These places are marked with signs and the book has a great photo of Hazel Glade and I assume that the fires made the areas look just like everywhere else instead of a track enclosed beautifully by trees and ferns. A short distance after Ferny Nook the tracks climbs up and higher than the Masons Falls lookout. This was a long climb and it seemed much longer and steeper than it actually was. A few walkers from the Masons Falls car park had the sense not to descend too far down the hill, it’s a long way back! Masons Falls are just beautiful and are well worth the effort. You can also drive to them and have a nice picnic. In fact, this would be a better starting place than the Blackwood Picnic area that the book suggests. As the falls are fed by a small stream they are best viewed after a heavy rainfall. 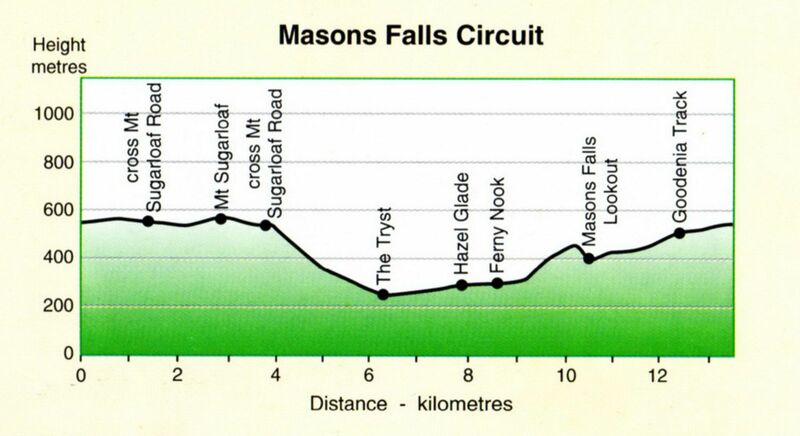 Gradient profile for the Mason Falls Circuit at Kinglake. 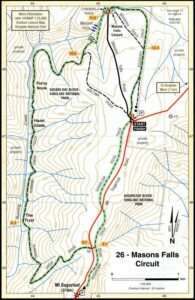 After Masons Falls is a pleasing loop which takes you past a nice stream and then the historical site of Carman’s Mill. The only thing left is a sawdust mound; and this was well overgrown. Further along and across the stream is the start of the tramway which transported items up and down the hill. Due to the vegetation I could not see anything. I didn’t see any Lyrebirds either! Boundary Track departs from the picnic ground (the facilities are new since the book was published) and once the bush is behind you there is farmland adjacent to the track reminding you that your time in the wilderness is coming to an end. 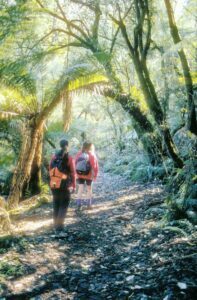 A sign says “Blackwood Picnic Area, 600m” and you feel relief that the walk is nearly over. Being tired the distance seemed to be well over a kilometre. A great walk that is best done when there has been plenty of rain to make Masons Falls be at their best. To skip the walk have a picnic using the excellent facilities at Masons Falls. The facilities at Blackwood are very basic and there’s not much to see nearby.